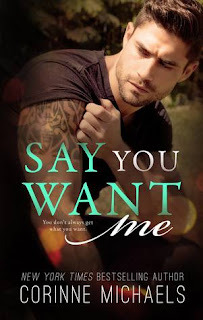 Corinne Michaels is one evil, evil, evil woman, just when I thought she couldn’t decimate my heart any more than she already has with her past books, she delivers Say You Want Me. I am an emotional reader; tear jerkers are my favourites and I crave that emotion like a normal woman craves chocolate. There is nothing more rewarding than when an author nails and I mean nails, character connection and delivers emotional overload…that is what Corinne Michaels delivered. This book reduced me to a sobbing, snotty mess and I loved it!! Angie Benson is a strong minded, fiercely independent woman. She is a business owner, has a small circle of friends and not a boyfriend in sight. She is anti-relationship and anti-romance. Her sister in law, Presley, who we met in Say You’ll Stay lives in Bell Buckle, Tennessee and on the last two visits Angie has hooked up with Wyatt Hennington, Zach’s brother. In Say You’ll Stay, Wyatt was the one character that really intrigued me and boy does Corinne Michaels deliver. It seems round two with Wyatt may have left Angie with more than she bargained for and now she needs to head back there to face the music. There is so much I want to say about this book, but everything is a spoiler and this is a book that you definitely need to go into blind. You need to let Corinne Michaels expertly play with your emotions as she cleverly takes you on a rollercoaster ride with Angie and Wyatt. A two-night stand does not a relationship make and these two have a lot of work in working out exactly what it is they both want. The chemistry between these two is seriously off the charts but there is a lot of history to get past and what with their current situation the pressures on them both are immense. Angie needs to re-wire her whole relationship mentality if her and Wyatt are to stand a chance and Wyatt goes all out to prove that he is more than worthy of her love and heart. Wyatt, like Angie, is anti-relationship, he thought he was in love once and she ended up with his brother so his heart is closely guarded. It is only as his relationship with Angie progresses that he realises that he had actually never been in love before…because he was now. He knows that what he is asking of Angie is immense but deep down in his heart of hearts he just hopes that he is worth it, that she wants it. I loved Wyatt with a passion, he was an incredible character and Corinne Michaels really nailed him and brought him to life. His vulnerability, his insecurities and his pure passion made him an unforgettable character and more importantly…real. Angie, while at times was frustrating, I could understand her and her reticence to put herself out there and uproot everything. It was a life changing decision and finally coming to terms with putting her heart on the line was extremely hard for her to do. As with any Corinne Michaels book the course of true love always has its ups and downs and this is where Corinne Michaels really brings out the big guns. This is where she rips your heart out with her bare hands, where she chops it up into little pieces and scatters it with ill regard. Where she then proceeds to stamp on those pieces and tears them to shreds with the soles of her boots and then spits on them for good measure…harsh…I think not. But the beauty with Corinne Michaels is she has a conscience and she does put your decimated heart back together again…albeit slowly…but the scars will always be left behind. This was an amazing story, totally unforgettable and a book that I will definitely read again. For those readers that crave those emotional reads, this is definitely for you, yes you do get your happy ever after but you will never forget the journey to get there.